Supermarine's Chief Designer, R.J. Mitchell, had won four Schneider Trophy seaplane races with his designs: (Sea Lion II in 1922, S 5 in 1927, S 6 in 1929 and S 6b in 1931), combining powerful Napier Lion and Rolls-Royce "R" engines with minute attention to streamlining. These same qualities are equally useful for a fighter design, and, in 1931, Mitchell produced such a plane in response to an Air Ministry specification (F7/30) for a new and modern monoplane fighter. This first attempt at a fighter resulted in an open-cockpit monoplane with gull-wings and a large fixed, spatted undercarriage. The Supermarine Type 224 did not live up to expectations; nor did any of the competing designs, which were also deemed failures. Mitchell immediately turned his attention to an improved design as a private venture, with the backing of Supermarine's owner, Vickers. The new design added gear retraction, an enclosed cockpit, oxygen gear and the much more powerful newly developed Rolls-Royce PV-12 engine, later named the Merlin. By 1935, the Air Ministry had seen enough advances in the industry to try the monoplane design again. They eventually rejected the new Supermarine design on the grounds that it did not carry the required eight-gun armament, and did not appear to have room to do so. Once again, Mitchell was able to solve the problem. It has been suggested that by looking at various Heinkel planes, he settled on the use of an elliptical planform, which had much more chord to allow for the required eight guns, while still having the low drag of the earlier, simpler wing design. Mitchell's aerodynamicist, Beverley Shenstone, however, has pointed out that Mitchell's wing was not directly copied from the Heinkel He 70, as some have claimed; the Spitfire wing was much thinner and had a completely different section. In any event, the elliptical wing was enough to sell the Air Ministry on this new Type 300, which they funded by a new specification, F.10/35, drawn up around the Spitfire. The elliptical wing was chosen for superior aerodynamic attributes but it was a complex wing to construct and the Messerschmitt Bf 109's angular and easy-to-construct wing offered similar performance (model per model) to the Spitfire. It has been reported that the Bf 109 took one-third the man hours to construct compared to the Spitfire. One flaw in the thin-wing design of the Spitfire manifested itself when the plane was brought up to very high speeds. When the pilot attempted to roll the plane at these speeds, the aerodynamic forces subjected upon the ailerons were enough to twist the entire wingtip in the direction opposite of the aileron deflection (much like how an aileron trim tab will deflect the aileron itself). This so-called aileron reversal resulted in the Spitfire rolling in the opposite direction of the pilot's intention. The prototype (K5054) first flew on 5 March 1936, from Eastleigh Aerodrome (later Southampton Airport). Testing continued until 26 May 1936, when Mutt Summers, (Chief Test Pilot for Vickers (Aviation) Ltd.) flew K5054 to Martlesham and handed the aircraft over to Squadron Leader Anderson of the Aeroplane & Armament Experimental Establishment (A&AEE). The Air Ministry placed an order for 310 of the aircraft on 3rd June 1936, before any formal report had been issued by the A&AEE, interim reports being issued on a piecemeal basis. A feature of the final Spitfire design that has often been singled out by pilots is its washout feature, which was unusual at the time. The incidence of the wing is +2° at its root and −½° at its tip. This twist means that the wing roots will stall before the tips, reducing the potentially dangerous rolling moment in the stall known as a spin. Many pilots have benefited from this feature in combat when doing tight turns close to the aircraft's limits, because when the wing root stalled it made the control column shake, giving the pilot a warning that he was about to reach the limit of the aircraft's performance. 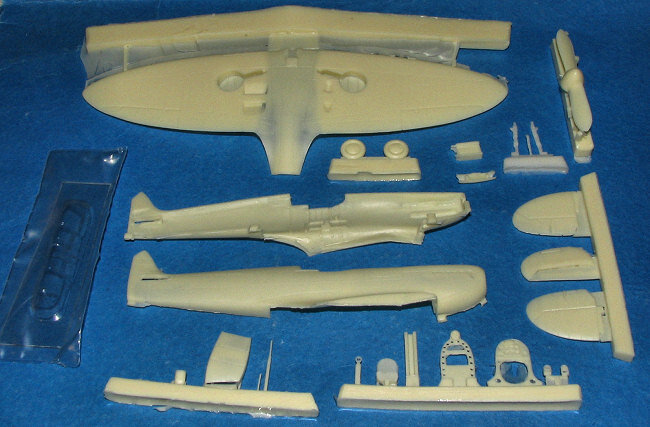 Though this isn't the first Spitfire prototype kit, it is by far the best I've seen in 1/72. The other kits I know about are a Pegasus low pressure injection molded kit and I believe that Rareplanes did a vacuformed kit of this one. None of those previous kits can match the detail and fidelity that is shown by this CMR product. CMR has chosen to model the type 300 on its maiden flight. This provides some differences from the later versions. For one, there are no landing gear doors. Secondly, there won't be any problems deciding what shade the aircraft was painted for this one is to be painted in Zinc Chromate Primer with Polished Aluminum parts and aluminum painted fabric. The instructions state a yellow green primer, which I have to assume is what most of us call RAF interior green as there are no color charts, only generic titles. The box art shows something akin to a grey so I'm a bit uncertain on how this is actually to be painted. The resin it superbly molded in tan with nicely engraved panel lines. The fabric detail on the control surfaces is quite good and should be appropriately convincing when painted. The Spit is a pretty basic aircraft when unencumbered with bomb racks and all that other stuff. This one has an interior that consists of a channel attached to two bulkheads. In that channel fits the control column, rudder pedals and seat. There is some flash on many of the parts but clean up will be very brief. There is nice sidewall detail that can be picked out in various shades. The wing is a single casting and does have the proper underside 'gull'. This area is quite thin to get this feature so one does need to take care. There are tabs on the stabs that fit into slots in the tail section. The type 300 had a different shaped radiator from the production aircraft and this is included. A nicely done Watts prop (I guess it is) is provided as are the usual pitot tubes. Two nicely molded early (flat) canopies are given. I always like a spare in case of incidents. Instructions are two sheets. One is a painting/markings guide and the other is a construction guide with large, well drawn steps. There is a nice dihedral drawing to help out getting the wings just right. Another drawing shows the proper angle of the wheels from the front. 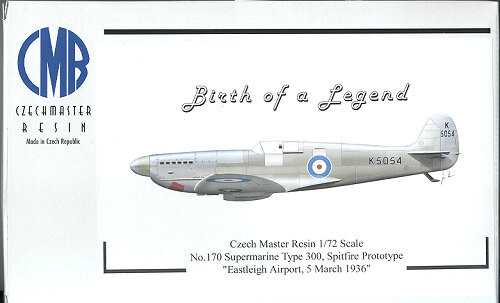 Decals are provided which are basically roundels and fuselage serial. An additional set of under wing serials are provided if you want to do this aircraft as it was later in life. For the initial flight, they apparently were not worn. Decals are fairly well printed, though I did notice some teeny smears on the wing roundels. They are also semi-matte and quite thin so should settle down well. Another superb kit from CMR. I'm beginning to think that these folks produce some of the finest resin kits around. This one of the Type 300 is a beauty and one that every Spitfire fan needs to have in their collection. Its simplicity also makes it a perfect first resin kit for those who want to give one a try.